“Politics” distinguishes itself from the “political,” which has as a characteristic that of contemplating, alongside the state, other holders [titolari], other subjects of political reality. Here then is a history of these subjects that is anything but over. Written towards the end of what we might call the “second period” of Tronti’s reflections, that of the so-called “autonomy of the Political,” sandwiched between the more famous phase of Operaismo and the – almost completely unknown to the Anglophone world – “third period” political theological phase, that of the twilight [tramonto] of the political, the short text translated here will come to many Anglophone readers of Tronti as a surprise. The heretical Marxist, the author of Workers and Capital who analyzed the development and dynamics of the “mass worker” and argued that the working class was the dynamic element of capitalism – within and against – but always shifting capital on (every innovation a failed revolution), and that the political form of capital was determined by the intensity and form of the struggle, now shifts the theoretical framework onto another, much more historical level: the longue durée of the capitalist state from the 16th century. 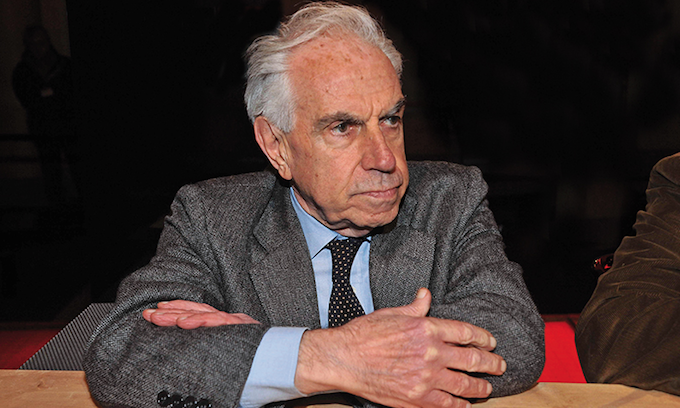 In the first phase of his work, Tronti confronted the theoretical and political problems that stemmed from the dynamics of industrial capital spreading at breakneck speed throughout the Italian peninsula in the 1950s and ‘60s, neo-capitalism (as it was known at the time), alongside the massive extension and concentration of the working class in terms of condition and unification of desire – and of the need to organize this spontaneity. In the second phase, the international crisis of capital in the late-‘60s and ‘70s revived, for Tronti and others, questions of past capitalist responses to economic and political crisis, bringing the state into relief. As Tronti argues in a number of texts throughout the 1970s, with the crisis of capital of 1929, with the “Great Transformation” discussed so insightfully by Karl Polanyi, capitalism would never be the same again. The role of the state, of politics – of bourgeois politics – would be that of stabilization. So, whereas capitalism is crisis, as so many have argued since Marx’s day, the state is order.2 It is this conjuncture – capitalism and state, crisis and order – that becomes the focus of Tronti’s thought from this period, driven by the concrete shifts on the ground that confronted the working class and its organizations. In the rest of this brief introduction, I shall try to outline the reasons for this shift. The “very gist, the living soul, of Marxism – a concrete analysis of a concrete situation”3; so why, precisely at this time – that of the crisis of the international capital of the 1970s – does Tronti decide that this “concrete situation” can best be analyzed through a study of the development of the “political” and of the bourgeois state (which are by no means synonymous, as we shall see) since the 16th century? Why is this the period in which Tronti decided to compose his first and only monograph, on Hegel of all people (Hegel Politico, 1975), an edited volume on the English Civil War (Stato e Rivoluzione in Inghilterra, 1977),4 and a subsequent four-volume edited anthology, of excerpts and critical essays on the leading bourgeois theorists from 1500-1800 (Il Politico, 1979-1982 – from which the translation below is drawn)? It should be noted, first of all, that this is by no means all that he worked on during this period – he continued to write on current affairs, such as the relationship that the Italian Communist Party (PCI) should maintain with extra-parliamentary movements and parties, the role of the Christian Democratic Party (DC) in the state-system, as well as more general articles on the nature of the political,5 and studies of more recent phases of capitalist restructuring such as the New Deal and Weimar.6 Alongside the important studies of the contemporary situation, he also sat on the Central Committee of the Italian Communist Party during the period of the “Historic Compromise.” Hence, although his work was not restricted to the study of the early history of the bourgeois state, it is clear that during this period, from the mid-1970s till the early ‘80s, much of Tronti’s theoretical work was focused upon the bourgeois state since the 16th century, and that this decision he saw as essential to renewing the theoretical and practical tools of the workers’ movement and its party. Why? What was the question to which this course of study was to provide an answer, the problem to which this would be a solution? And what of these problems, these questions, is alive today after – or within – the Great Recession? Let us begin, then, by briefly outlining the – frequently misunderstood – problem that Tronti encountered in this period. Doing so will help us understand why the history of the bourgeois state, from its origins in the 16th century, becomes so important for Tronti at this specific historical moment; it will also serve to correct some of the misunderstandings that have bedevilled many subsequent interpretations, standing in the way of an adequate theoretical and practical interpretation of the question of the autonomy of the political. The first thing to note is that the series of reflections that would converge on the idea of the autonomy of the political, did not come fully formed and, arguably, never did find a definitive formulation.8 The autonomy of the political can be best described as a field of forces, of unresolved tensions that circumscribe a problematic theoretical and practical space that stems from a concrete conjunctural intuition: that once capitalism ceases to be a progressive force, i.e. when it ceases to be able to integrate the working class through a reformist moment of wage increases and heightened consumption (as during the so-called Fordist-compromise), the command of the state by bourgeois parties permits the strategic use of crisis – most notably under Thatcher and Reagan – to restructure the working class, fragmenting and isolating it geographically, sectorially or within the space of production, thereby permitting the process of the reproduction of capital to be re-established on a new and more advanced terrain of integration.9 This intuition of the active role of the state in the reproduction of capitalwould be developed further, in a series of analyses of the relation between economic crisis and the political to an investigation into the history of the bourgeois state since the Great Depression. The autonomy of the political identifies a phenomenon of the Great Transformation. It accounts for how the bourgeoisie, confronted with economic crisis, used the state to restructure society from above, in tandem with capital. This is a necessity driven by crisis and by the combined and uneven development of capital and of its state, of the mechanisms of the state, sometimes in advance (as during the New Deal), more often retarded with respect to capitalist development (as in the Italy of the 1960s-‘70s); of the different articulations of fractions of capital with one another; and of capital and its state in relation to the level of development of its great antagonist, the working class. The question of the autonomy of the political is the question of the mechanisms at the disposal of capital10 to mediate between, to manage and to coordinate its fragments, its advances and delays, and its antagonist – a function that is initially called upon when the mechanism of development breaks down. The question to which the autonomy of the political is an answer, is not only – as so many left critics have described it, and despite evident ambiguities and rhetorical excesses11 – that of the proper relation of the Party to the class or to the state, or – for that matter – of the class to the state (although it is also this). The problem is not merely that of the correct form of political participation; the problem is also how to count politically within the bourgeois state.12 More specifically, the reality of the 1970s posed a problem with two component parts: given the autonomy of the political – “a fact of capital … I repeat, so that people stop pretending not to understand”13 – how can the workers’ movement make use of this autonomy in order to intervene at the level of the state? We can speak, only half in jest, of a New Political Policy, the use of the autonomy of the political, that eminently bourgeois invention brought in most recently to save capital from its crisis (in the ‘20s and ‘30s), in order to advance the workers’ movement. This is the problem and the challenge that Tronti tries to develop in this period. To return, then, to our starting point. Why did Tronti feel the need to spend much of the 1970s, at the same time as that he was arguing for the appropriation – in theory and practice – of the bourgeois autonomy of the Political, i.e. of the mechanisms for the reproduction of capitalism, by the workers’ movement, carrying out an analysis of the political over the longue durée? What then of today? Today, after the end of the long twentieth century of the European workers’ movement, when once again the state is assailed by numerous, even more powerful potestas indirectae; when the subjectivity of the state seems ever more closely aligned with that of international capital, what can Tronti’s work on the autonomy of the political still teach us? It continues to confirm that this autonomy is indeed “a fact of capital” and that without a workers’ movement capable of appropriating those instruments of the state for itself, the political is forced to migrate to another terrain, one where it may be better served; recognizing, at the same time, that by so doing, it will have left an instrument of inestimable power for the sole use of those whose interests are the reproduction of capital and exploitation. What Tronti allows us to think is the different and changing articulations of the political, of how it can intersect with and be pulled from the state; how it can serve to re-establish order – its function of stabilization within capitalist crisis – as well as the potential for it to be appropriated to reconfigure the reproductive mechanisms for the purposes of other subjectivities and interests, antagonistic to those of capital; but always, within capital, it is the quality of its autonomy that will determine its function and effectiveness in intervening in the process of reproduction. When that autonomy diminishes, or is too clearly subordinated to specific interests, its effectiveness is eroded – think of the Great Recession, of the way that the state has been subordinated not to international capital in general, but to finance capital, eroding both consumption as well as productive investment, rerouting cheap monetary flows into share buy-backs stoking the stock market and real estate bubbles while exacerbating geopolitical and economic instabilities, while evacuating the state of the means to serve further rounds of reproduction and stabilization, leaving capital open to its always threatening crisis and without its principle of order. The position Tronti leaves us in is perhaps an unsettling one; but he leaves us with a great lucidity about our condition and the analytical tools to begin to think possible new articulations of the political and – perhaps – eventually to avail ourselves of them. I would like to thank Giorgio Cesarale and Alberto Toscano for their careful reading and perceptive comments to the introduction and translation. Unfortunately, I have not been able to resolve all the issues that they have raised.